An Apollo 11 mission-flown, crew-signed commemorative cover is set to lead Heritage Auctions' Space Exploration Signature Auction in Dallas on November 12 with a $40,000-60,000 estimate. The lot is one of just 214 of covers carried aboard the mission. It bears a cancellation date of August 11, 1969 - 18 days after the three men returned safely to Earth. The covers were split between each crew member, with Armstrong holding 43, Collins 63 and Aldrin 104. To date all of Armstrong's remain off the market - the present example comes from Michael Collins. Heritage comments: "Apollo 11 splashed down on earth on July 24 at which point, the equipment, and astronauts from the spacecraft were quarantined. "As soon as this cover was released, it was taken to the nearest post office for cancellation. This is the pinnacle, the ultimate, for any collection of space-related covers." It's presented along with a letter of provenance from command maodule pilot Michael Collins that reads: "I hereby certify that the accompanying Apollo XI Official Commemorative Cover, numbered C-59 written within the earth image, further identified with the August 11, 1969 Webster, TX postmark, the Lunar Receiving Laboratory quarantine stamp and the original signatures of the crew, is one of my 63 covers that flew to the moon with me aboard the mission July 16-24 1969." Flown Apollo 11 covers have sold for up to $46,000 in past auctions. 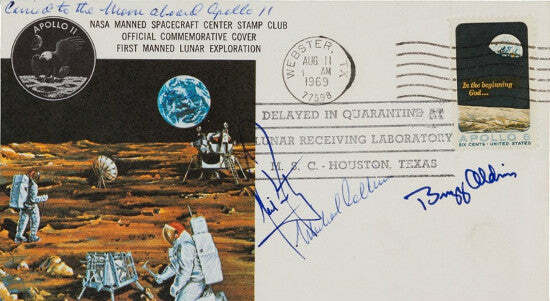 We have this complete set of Apollo 11 crew signatures available. Please sign up to our free newsletter to receive exciting news about space and aviation memorabilia auctions.